Universal VMEbus 16 serial channel board. 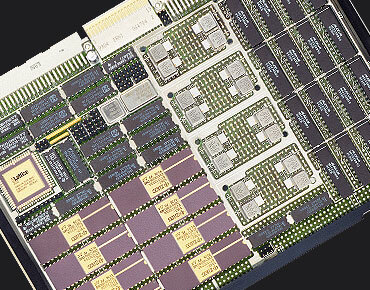 Based on the SCC Z-8530/85230 with up to 20 MHz & communications up to 5 Mbs. CM-IOC-40 is a universal 16 serial channel VMEbus board that incorporating features most demanded in first class military & industrial applications. Based on the SCC Z-8530/85230 up to 20 MHz, all serial channels can be factory fitted for RS-232, RS-423, RS-422, or RS-485 EIA standard levels. An extremely versatile baud rate generator allows any standard or non standard communication up to 5 Mbs. 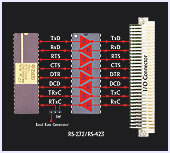 Built-In-Test per channel based on a dual wraparound loop that disconnects serial I/O signals & connects internal test signals to verify correct operation. Military versions with thermal overlay greatly improve capability to withstand shock & vibration. The CM-IOC-40 offers a highly flexible I/O cabling solution using VME64x connectors on the front panel and P2/P0. Both connectors have identical pin-outs. Serial channels: 16 independent full duplex channels. 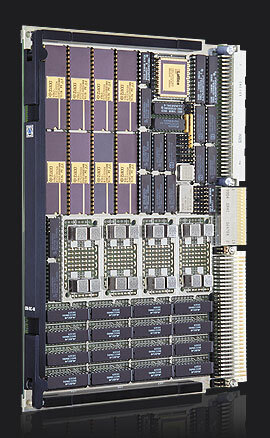 Serial controller (SCC): 8 industry standard Z-8530 or Z-85230 chips @ 8-10-16-20 MHz. Each serial controller has two complete serial ports. 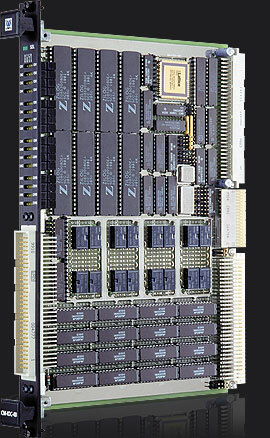 Z-85230 features: Supports sync/async operation, on-chip baud generator, HDLC/SDLC protocols, digital PLL, automatic CRC, etc. Serial levels: All serial channels can be factory fitted to operate at RS-232, RS-422, RS-423 or RS-485 EIA standard levels. Serial signals: Support for TxD, RxD, CTS, RTS, DCD, DTR, CLK-in and CLK-out per channel. Serial transceivers: Accept a wide set of I/O devices in all temperature ranges supplied by SIPEX, MAXIM, NATIONAL, LINEAR, etc. i.e. MAX490, LTC490, SP490, SP485, MAX485, LTC485, DS3695, MAX238, HIN208, SP238, DS14C238, etc. Galvanic isolation: All serial channels optionally support isolated I/O lines (> 1000 Vp), offering fully floating serial lines with respect to other channels or VMEbus signals. Front panel LEDs: 64 LEDs distributed with four LEDs per channel which are illuminated when the RxD, TxD, CTS or RTS lines are active. Control Register: Activates the dual Built-In-Test circuitry. TTL level Built-In-Test: checks 100% of module TTL chips. Disconnects SCC serial lines to/from the transceivers and interconnects all serial channels amongst themselves in pairs. Transceiver Built-In-Test: determines any transceiver failure. 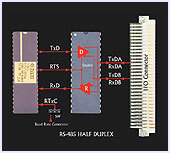 A set of BIT relays isolate serial signals from the application and interconnects all serial channels amongst themselves. 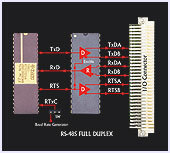 RS-232/423 signals: Tx, Rx, CTS, RTS, DCD, DTR, 2xCLK. 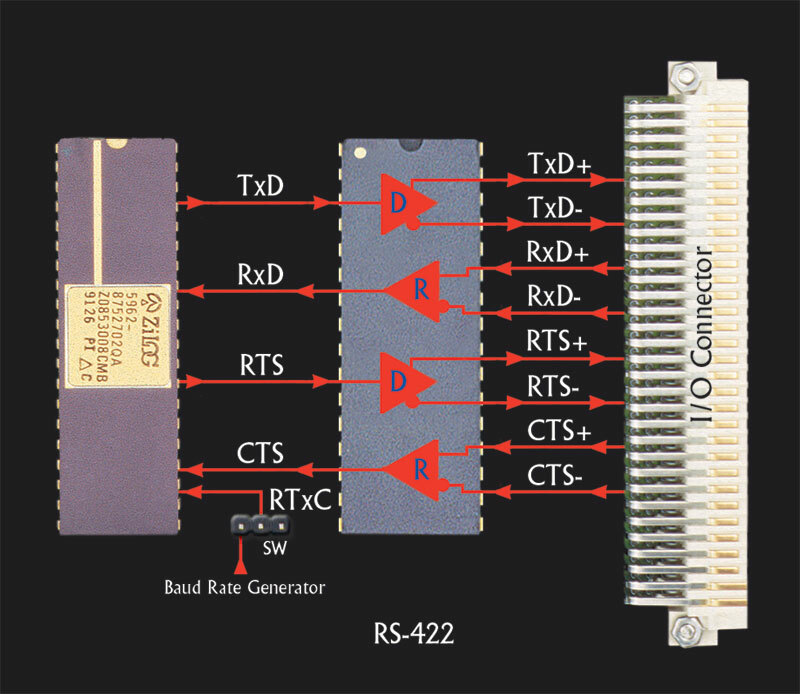 RS-422 signals: Tx, Rx, CTS, RTS. 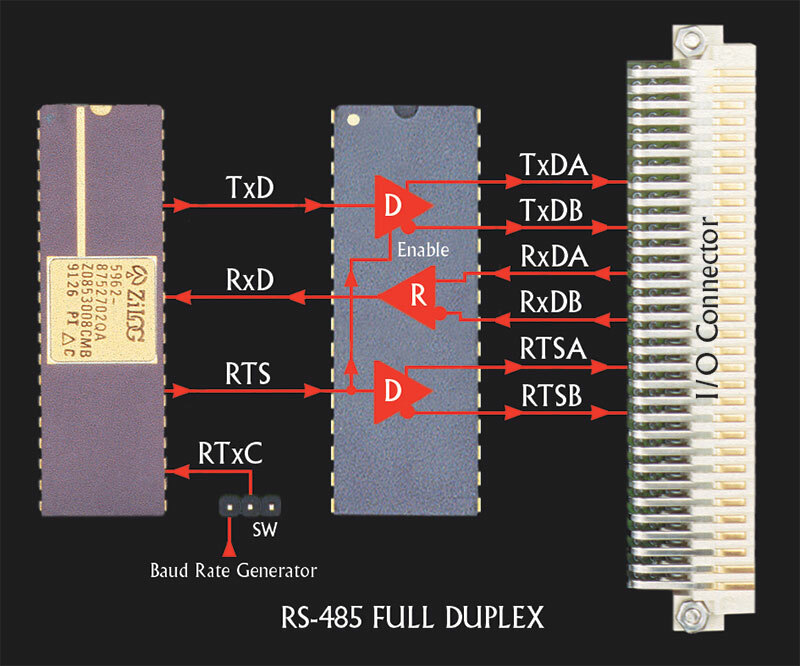 RS-485 signals: Tx, Rx (full duplex); bidi AB (half duplex). 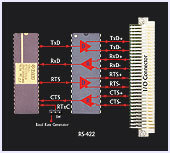 VMEbus Interrupter: I(1-7). Manages IRQs from all SCCs. 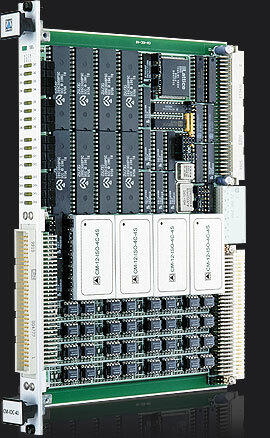 VMEbus Interface: A24/D08 (EO) Standard slave interface. VME Addressing: Two jumper blocks provide 256 mapping options in the A24 range. Weight: 570 gr. C & I ver. ; 770 gr. R+ & 883 ver. CM-IOC-40/A: IEC-297 mechanics for 19 inch racks with I/O on front panel. CM-IOC-40/B: Military IEEE P1101 wedgelock mechanics for ATR enclosures. 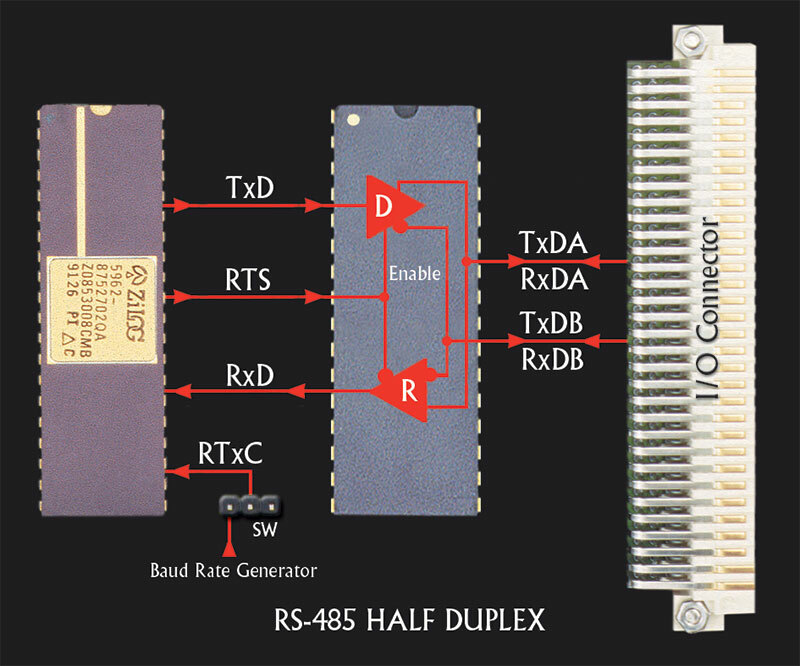 16 full-duplex serial channels per board. Channels can be factory fitted to RS-232,RS-423, RS-422, or RS-485 standard levels. Optional full galvanic isolation >1000 Vpon serial channels including handshake lines. Supports a wide set of military or industry standard transceivers from leading vendors. Built-In-Test wraparound loop allows testing of all TTL chips and serial controllers. Serial line Built-In-Test wraparound loop allows testing of all on-board transceivers. Overvoltage protection for most transceivers. 64 LED indicators on front panel show all channel TxD, RxD, CTS, and RTS status. VMEbus Interrupter supplies independent Status-ID vector per serial controller. 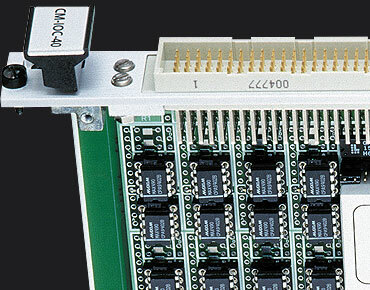 Serial I/O signals via 160 pin VME64x connectors on front panel, P2 and P0. 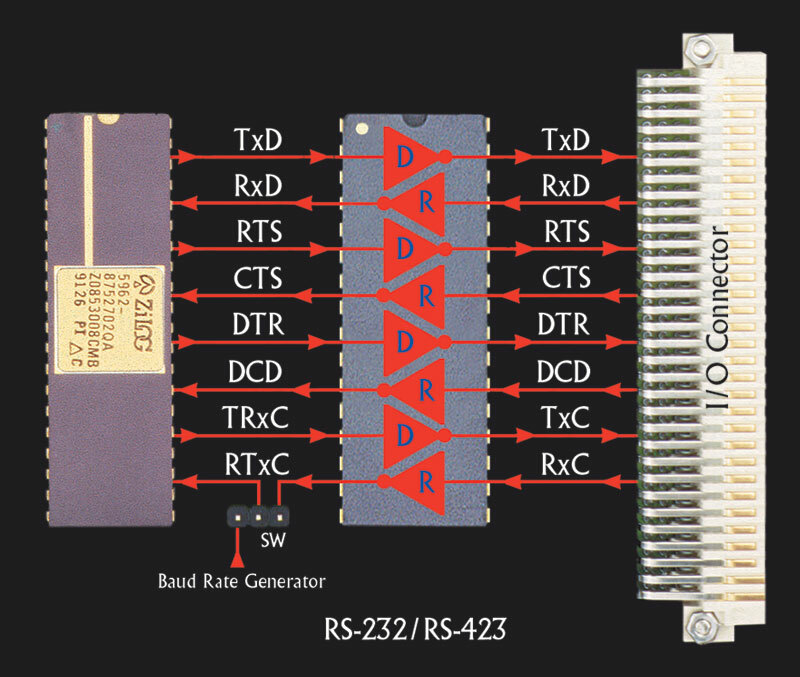 Versatile baud generator covers any serial rate. 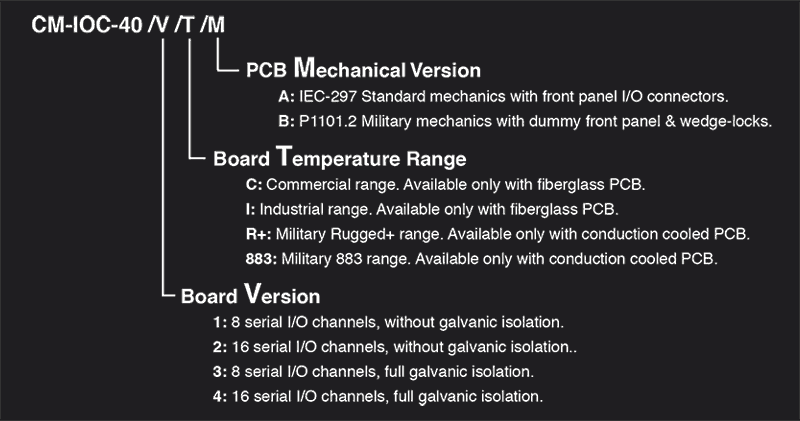 Industrial, MIL-Rugged & MIL-883 versions. IEC-297 mechanics with I/O via front panel and military P1101. 2 wedge-lock mechanics. 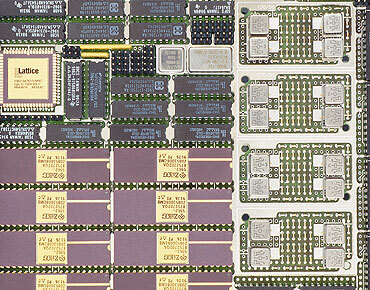 Conduction cooled PCB with thermal overlay in MIL-Rugged and 883 versions. 1: 8 serial I/O channels, without galvanic isolation. 2: 16 serial I/O channels, without galvanic isolation. 3: 8 serial I/O channels, with galvanic isolation. 4: 16 serial I/O channels, with galvanic isolation. - 8 Serial I/O channels RS-232, full galvanic isolation. LEVEL 1, CM-IOC-40 MAP: User´s manual. Module hardware functional description oriented toward software development. LEVEL 2, CM-IOC-40 MMT: Maintenance manual. Extended description intended for failure location in the module. IMPORTANT: The user must fully specify the serial levels requirements. All serial channels can be factory fitted to operate at RS-232, RS-422, RS-423 or RS-485 (full or half duplex). Wind River Systems VxWorks Tornado: The CM-IOC-40 is supported by VxWorks Tornado. This operating system is ideal for developing real time software under UNIX environments. A complete "C" language driver in source code is available at low cost. Drivers include a floppy-disk and user's manual. Mentor Graphics MCC-68K Drivers: A "C" language source code driver written for the popular MCC-68K cross-compiler from Microtec is also available. This low cost option is intended for using a PC as host.